A NASA grant creates an opportunity for researchers to conduct longterm experiments with dust clouds in microgravity, which may open the door to better understanding everything from the birth of stars and planets to city smog. Julie Brisset, an associate scientist in planetary sciences, will work with the aerospace manufacturer Blue Origin to test a new microgravity experimental technology. 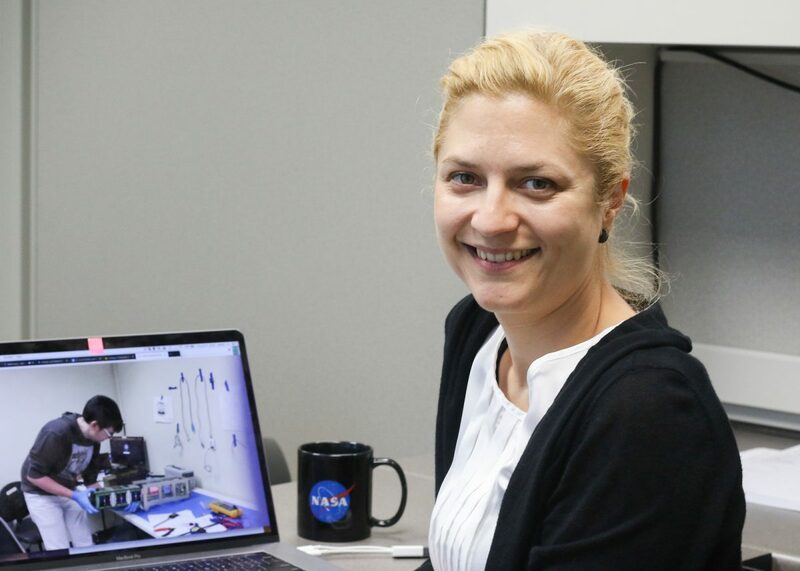 Brisset, who earned her doctorate in 2014 at the University of Braunschweig in Germany before becoming a postdoctoral fellow at UCF, will work with the aerospace manufacturer Blue Origin to test a new microgravity experimental technology. The Dust In-Situ Manipulation System is a platform that allows for the long-term study of homogenously levitating dust clouds in microgravity. The DIMS will be able to conduct undisturbed observation of dust clouds for several minutes, a feat that has not been demonstrated before. When looking at a dust cloud for instance, the spectra of clouds can be different depending on the grain size and materials of the grains that make up the clouds. Researchers are interested in experimenting with dust cloud composition in microgravity to better understand if specific spectra are produced due to different grain sizes and shapes, or different materials. On Earth, researchers are limited in the ways in which they can study levitating dust clouds as gravity impedes the production of a cloud with particles that homogeneously sit in the air. In a lab setting, researchers have been able to use air jets and ultrasound contraptions to levitate clouds, but they run into the problem of particles being sorted by size rather than levitating homogeneously. Drop towers can be used to achieve freefall, simulating microgravity conditions found in space. But even then, freefall conditions only last for a few seconds, limiting observation time. The Blue Origins flight will create approximately three minutes of freefall microgravity conditions inside the rocket. DIMS will be on board and will conduct a number of different experiments in those three minutes. If it works, the ultimate goal is to launch DIMS into orbit where it will be in freefall conditions for a year. While on the flight, DIMS will create dust clouds by injecting dust particles into its chamber and using its cloud manipulation system to confine the particles, allowing them to stay in a cloud. High-speed cameras will be used to create three-dimensional images of the clouds created. During the three minutes of microgravity, four experiments lasting approximately 40 seconds will test cloud creation using three different dust types and two different gas pressures. “The ultimate goal is an orbital platform that can be useful for a range or scientific activities. So with Blue Origin, this is our first test in an actual long term microgravity,” says Brisset. Understanding levitating particles is of interest in a number of different fields, from astrophysicists investigating the birth of stars and planets to atmospheric scientists researching city smog. If DIMS is approved to go into orbit, researchers from these various fields would be able to conduct their research over hours to months. Brisset is excited to see the collective work of a number of her colleagues be launched into this next step. “I think it’s really exciting to get into that phase of the project where you’re actually going to see something fly,” she says.